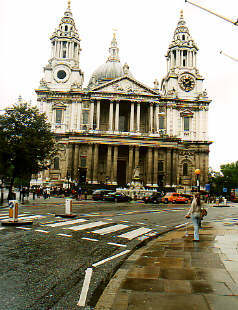 The dome of the St. Paul's Cathedral in London is one of the biggest in the world. The internal diameter of the dome is 33 meters (110 feet). Roman Pantheon (43 m), St. Peter's (42 m), El Duomo, Florence (39 m), Bijapur (37 m), Blue Mosque (34 m), Hagia Sophia (30 m), US Capitol (28 m) and Sultanieh (25 m). 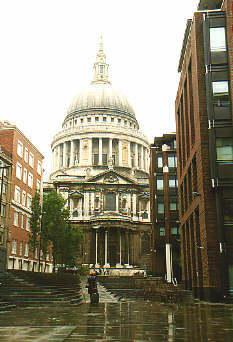 When climbing the stairs to the ring just under the ball and cross, we found out St Paul's has two domes over each other. The real construction starts at the bottom of the row with the pillars. 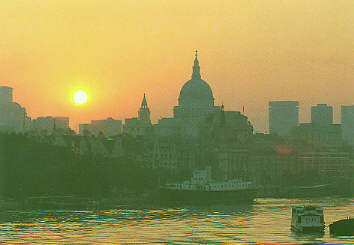 In the scheme this is symbolized by the red dome. On top of this dome there is a cone, the green line. This cone is a pretty heavy construction and, together with the pillars, supports the second dome, the blue line. 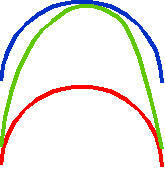 The pillars are not shown in this scheme, they stand between the bottoms of the red and the blue dome. The blue dome is only the finishing touch. The inside of the St. Paul's is beautifully decorated. 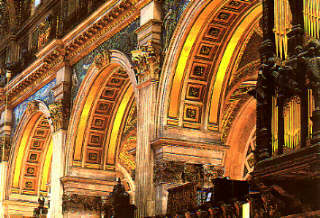 From the first gallery, the Whispering Gallery, you have the best view of the paintings inside the dome. But the Choir and Ambulatory have even better decorations. 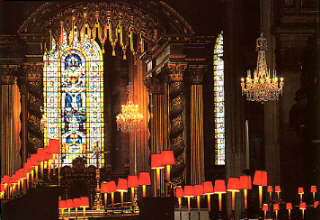 The orange lamps for the choir boys do not make it look better, though.